Habitat: Red Currant is native to Western Europe, from Spain and Portugal to Germany and Netherlands. 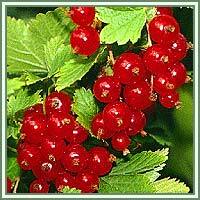 Description: Red Currant is a deciduous shrub reaching a height of about 1.5-2 meters. Leaves are spirally arranged on the stems, single and lobed, deep blue green in color. Flowers appear in early spring, in drooping, pendulous racemes. They have a distinct, yellow-green color. Fruits are translucent red berries containing 3 to 12 minute seeds. Useful components: Vitamins B1 and C, iron, phosphorus, potassium, fiber, copper and manganese. Medicinal use: All the Currants are an excellent source of vitamins and antioxidants, and can be a beneficial immune booster. 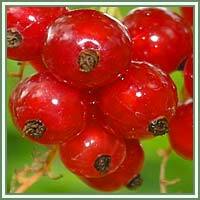 Red Currant have mildly laxative, astringent, appetite increasing, diuretic and digestive properties. It can calm stomach upsets. Tea made from dried leaves can be helpful in relieving the symptoms of gout and rheumatism. It can also be useful in treatment of slow healing wounds, and as a gargle in cases of mouth infections.